Equipo Nizkor - Obama, Castro share handshake at Americas summit in Panama. US President Barack Obama and Cuban leader Raul Castro exchanged greetings and handshakes at the opening of the 7th Summit of the Americas in Panama on Friday, the US National Security Council spokeswoman has said. The US and Cuban leaders "greeted each other and shook hands," Bernadette Meehan told journalists. A White House official said Obama and Castro had no time for conversation on Friday. They are due to have the first face-to-face meeting on Saturday. 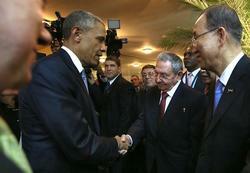 This is the second time when Obama and Castro shake hands. The first brief handshake was captured during the December 2013 memorial service for South African anti-apartheid revolutionary Nelson Mandela in Johannesburg. Four months ago, Obama and Castro announced plans to normalize relations between the United States and Cuba. Since then, the sides have been in talks on opening embassies in Washington and Havana and resuming trade relations. Ahead of the opening of the summit late on Thursday, US Secretary of State John Kerry held talks with Foreign Minister Bruno Rodriguez for the first time. The diplomats said the discussion was very "constructive." A senior State Department official said: "We don't have much more at the moment, but apparently they "made progress. ".